Chan Kim and Renée Mauborgne’s Strategy Canvas is a central diagnostic tool and an action framework that graphically captures, in one simple picture, the current strategic landscape and the future prospects for an organization. © Chan Kim & Renée Mauborgne. All rights reserved. The horizontal axis on the strategy canvas captures the range of factors that an industry competes on and invests in, while the vertical axis captures the offering level that buyers receive across all of these key competing factors. A value curve or strategic profile is the graphic depiction of a company’s relative performance across its industry’s factors of competition. The strategy canvas allows your organization to see in one simple picture all the factors an industry competes on and invests in, what buyers receive, and what the strategic profiles of the major players are. It exposes just how similar the players’ strategies look to buyers and reveals how they drive the industry toward the red ocean. Importantly, it creates a commonly owned baseline for change. It captures the current state of play in the known market space, which allows users to clearly see the factors that an industry competes on and invests in, what buyers receive, and what the strategic profiles of the major players are. 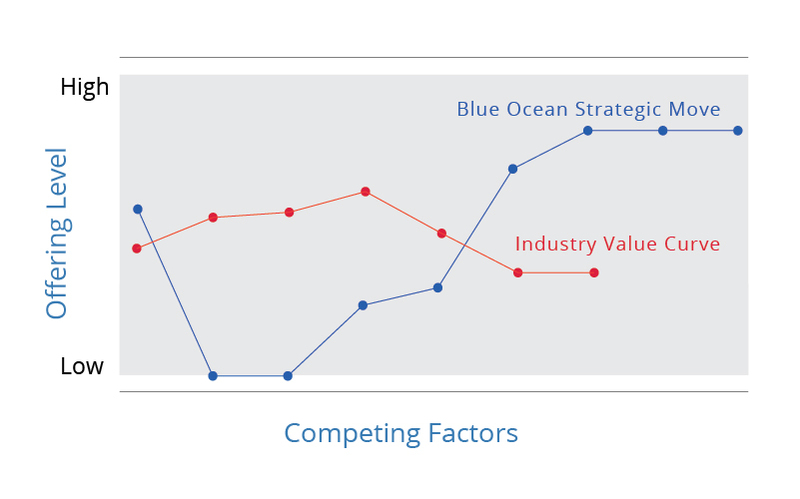 It propels users to action by reorienting their focus from competitors to alternatives and from customers to noncustomers of the industry and allows you to visualize how a blue ocean strategic move breaks away from the existing red ocean reality. Get Blue Ocean Shift to learn the ins and outs of how to put this tool in practice. Try for free our Blue Ocean Studio™, an online collaborative workspace for applying the blue ocean tools in practice so you can get started today. Chan Kim and Renée Mauborgne have created a comprehensive set of analytic tools and frameworks to create blue oceans of new market space. In their 2017 New York Times bestselling book, Blue Ocean Shift , Kim and Mauborgne share how to put these practical market-creating tools into practice to move from red to blue oceans and to do so in a way that people own and drive the process. Learn and apply these tools and frameworks to execute successful blue ocean shifts using our fully interactive and guided platform Blue Ocean Studio™. All analytic tools © Chan Kim & Renée Mauborgne. All rights reserved. Don’t just check out the tools. Learn how to put them in practice. Find out what works, what doesn’t, the potential pitfalls along the way and how to avoid them to achieve the best results in your organization. Get your copy of Blue Ocean Shift now, and get all these answers plus so much more including exercise templates you can use to apply each tool in your organization. Learn, apply and execute successful blue ocean shifts using the fully interactive and guided Blue Ocean Studio™.